Ski in Ski out Condos at Park City - Canyons Village. 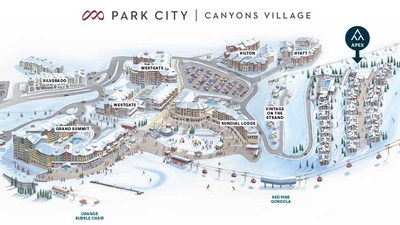 Have you been waiting for an opportunity to own a luxurious new ski-in/ski-out condo or town-home at Park City's Upper Canyons Village? We are excited to announce the release of this exclusive collection of architecturally stunning ski-through resort retreats located slope-side at the largest ski area in the United States. Apex will occupy a premier site perched above the resort pedestrian village that Vail Resorts plans to build with upscale retail and dining offerings. Apex Park City will have a ski run meandering right through the project, so the ski in ski out access to these new condominiums and town-homes will be excellent. A true all-in-one village, Canyons Village provides a gateway to the the largest ski resort in the United States. Vail Resorts 2015 investment in on-mountain improvements $50 million to connect Park City & Canyons Resorts, build new ski runs, and a new restaurant at the base of the new Quicksilver Gondola. The designer of Apex Park City is Andrea Wood Interiors. Originally from Colorado--but well-known in the Park City, Utah area for their Village at Empire Pass ski-in ski-out Deer Valley projects at Larkspur and Flagstaffs. The Fresh Powder interiors package includes finish selections that embrace the natural weathered texture of the mountain surroundings in lighter, fresher colors giving the space a peaceful, relaxed feeling. The Black Diamond package offers richer, more saturated colors with finishes that feature a contrast between off-white, light warm gray, and deep carbon colors for a more dynamic and dramatic look. The main reasons you'll love Apex are the incredible views looking over the Canyons base area, effortless summer and winter trail access right through the Apex neighborhood, the convenience of picking up the phone and calling the on-site concierge, and making use of the Apex private shuttle service. All parking in the project will be underground, and all residences have private ski rooms. The stunning clubhouse at Apex will offer owners private access to 5,800 sq ft of amenitites. 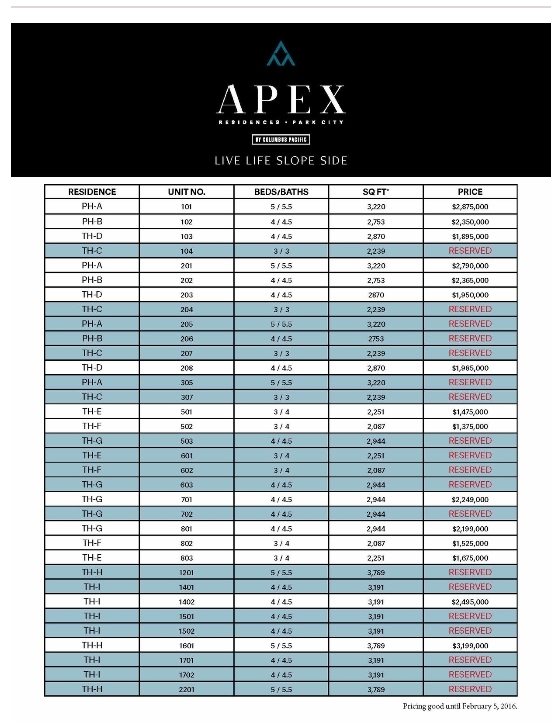 APEX will be buildt by Big D construction, and the property will be managed by Vail Resorts Hospitality.